The day I have been dreading for six months finally arrived. 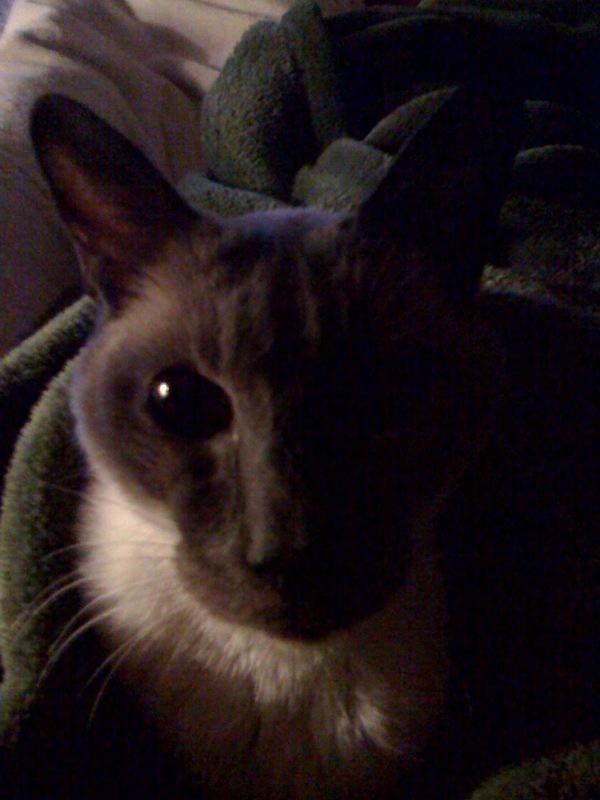 I took our mouthy little Siamese to the vet for the last time. He has been sick for some time and has been steadily declining after a brief rebound over the summer. Two days ago he had a seizure and lost use of his hind legs for a few hours. By evening he was at least able to walk again, but it was readily apparent that his time had come. I told our five year old daughter to give him a hug and a kiss goodnight. I had no illusions about what would happen when I took him to the vet the next day. 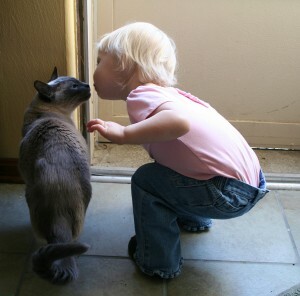 Jen wrote a nice post on what this little cat meant to our family. When Kwoan and I arrived at the vet we were sent right into the examination room. The vet soon came in and reviewed Kwoan’s history, talked with me about how he had been doing and gave him an exam, confirming that he had cancer. He said there were two options. The first was to take him to an animal hospital where they would further confirm the cancer and could do surgery or start chemo. The second was to put him to sleep. As tough as it was I knew that the right decision was the latter. I could not imagine putting him through surgeries and treatments that would only prolong his pain. The process was fairly simple. One tiny shot under the skin that would make him doze off and then another intravenous shot that would end his life. The staff was very helpful and did everything to make Kwoan and I as comfortable as possible under the circumstances. After Kwoan received the shot to make him doze off he crawled into his carrier and drifted off to sleep. In that moment I thought “Stop, it’s not too late,” but knew that would just be selfish on my part. The vet then took him out of the carrier and gently laid him on a towel. I could see he was peacefully asleep, still breathing. I kept petting his head and rubbing behind his ears the way he loved. They proceeded to shave part of his leg and give him the second injection. A few minutes later the vet checked his heartbeat and informed my that he was gone. The staff then left the room to give me a few moments with him. I said my goodbyes and left him lying there at peace and out of pain. After arriving back home I knew Jen would be home with our daughter soon and that I would have to break the news to her. She was sad and at five does not yet fully understand what dying means. Later that night I realized that perhaps I didn’t either. I had never witnessed a life at its last breath as I suspect few people have. At the time I think I was a little emotionally numb, just trying to get through something that had been coming for a while. Being there did not hurt so much as the feeling of responsibility. The fact that I brought Kwoan there, that I had made the decision to end his life. Even though I know it was the right decision, it still hurts and I can not help but feel I have lost a little shred of my humanity in making that decision. It is not a decision I can ever undo or go back and “make right”. The finality keeps coming back when I feed our other cat and accidently pull out two cans of food or I realize I don’t have to tip-toe around the kitchen to avoid Kwoan’s tail as he was always underfoot or be woken in the middle of night by his alley cat caterwauling. Scottsweep.com is powered by	WordPress 3.9.1 and delivered to you in 0.968 seconds using 28 queries.